Staying up past 11 PM to play games and chat with best friends meant that I did not post yesterday’s picture. My evening was well spent though and I have no regrets. Although I do appreciate technology and the fact that it allows me to see and hear friends who live thousands of miles away, I still hope that one day we find ourselves in the same city for a few years. If I ever become an extremely wealthy person (for although it is a slim chance, there is still a chance) then I shall purchase houses for all my close friends and have them live there whenever they want so I can hang out with them. A little more than a month ago, my family came over for dinner. Throughout the evening, Kevin stuck googly eyes around the apartment. I found many of them within a couple of days (tissue boxes, butter, honey bear), but these googly eyes on the box of litter took me at least a month to find. Since Pippin doesn’t use the litter box that often (he goes outside most days) I don’t have to refill it on that frequently. So the other day when I went to use it, the kitten’s eyes took me by surprise. Quite a good spot to put them, Kevin, I applaud you for that. I had a laugh out loud moment. It brightened the rest of my evening. Today’s picture is of Pippin while we were out walking. It’s been quite cold the past week so Pippin hasn’t had much time outside. The poor guy has expressed his frustration by knocking over and rummaging through the living room trash can multiple times. I know the both of us are ready for warmer days. Since this morning brought with it a bit of sun and slightly higher temperatures, Gene and I took a walk with Pippin in tow. He has handled the snow much better than I thought he would. The picture above shows him watching a rabbit. He enjoys running after them but is never fast enough to catch one. It’s probably for the best. Those eyes made me laugh! Happy memory of a fun evening at your place. 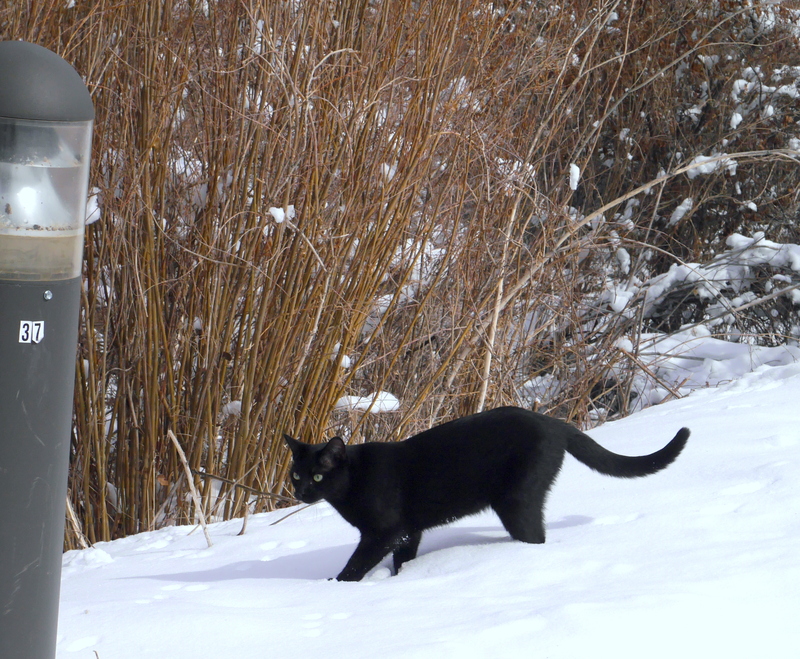 And Pippin’s shiny black coat is a great contrast to the white now. Nice pic!